Panel leaf artwork licensed by Colourbox.com DO NOT color sort nor stitch as one color. There must be color stops to force a machine stop to re-hoop stabilizer and stitch 2 leaves, 4 circles, and 8 pumpkin panels. 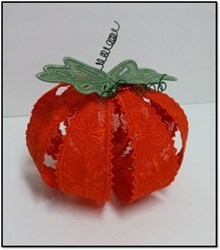 See "FSL 3D Pumpkin" project instructions for assembly. Pumpkin stitched out perfectly. I wish there were more complete instructions for assembly. Ramona Baird is happy to present FSL 3D Pumpkin machine embroidery design which has 216464 stitches and is [111.00 mm x 172.21 mm] large. If you would like to view more embroidery patterns please search on our embroidery designs page. 1. Isacord 5833 Hoop two layers of fibrous water-soluble stabilizer and stitch leaves. 2. ARC Poly 253 Hoop two NEW layers of water soluble stabilizer and stitch circles. 3. ARC Poly 253 Hoop two NEW layers of fibrous water-soluble stabilizer and stitch pumpkin panels set 1. 4. ARC Poly 253 Hoop two NEW layers of fibrous water-soluble stabilizer and stitch pumpkin panels set 2. 5. ARC Poly 253 Hoop two NEW layers of fibrous water-soluble stabilizer and stitch pumpkin panels set 3. 6. ARC Poly 253 Hoop two NEW layers of fibrous water-soluble stabilizer and stitch pumpkin panels set 4.